Random vibration testing is intended to verify that the device under test will withstand the vibration and perform to specifications afterward. Test accuracy is expected. Accuracy of signal generation, signal measurement, filtering and control algorithms are required to ensure accurate test results. View all of your spectra on demand. JAGUAR ’s hardware superiority permits the control scheme to deliver the most accurate and rapid closed-loop control available. Loop times are well under a second with virtually no negative impact from the addition of control channels. 98 control/limit channels assure that even the largest, most complex structure can be controlled. Limit channels further enhance large structure control and accuracy. Each limit channel may have its own reference profile. The ability to view all measurement channels, limit channels, H(f), as well as computed spectra in real-time and simultaneously means you never have to wonder if your data are good. 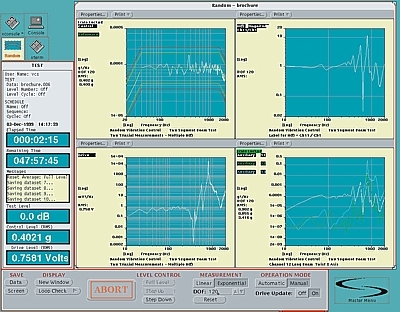 You can also examine all criteria for test accuracy while the test is underway, i. e. , each PSD for each control channel that comprises the aggregate control, each limit channel PSD as well as limit profiles, H(f)that are composed in part or whole by control channels also engaged in averaged control, phase, coherence, and more. Random signal generation using a 48 bit random number sequence means JAGUAR produces the “most random ”test ever produced by a digital control system. Coupled to the most advanced phase randomization techniques you are assured of a very accurate test. JAGUAR ’s patented Adaptive Control Algorithm gives you peace of mind knowing that non-linear structural problems will be controlled more rapidly and more accurately than with any other approach currently available. All of these data would be of no value if the software were difficult to use. For 10 years customers the world over have rated Spectral Dynamics ’ user interface the easiest to use and the most capable. An optional feature for JAGUAR is the ability to add throughput disks to each Acquisition and Control Peripheral (ACP). Disk capacity from nine (9)GBytes up to more than thirty (30)GBytes is available. As many as 6 drives per ACP are permitted. MISO Random permits time data to be streamed to the throughput disks during control so that a permanent record of the test and all measured responses may be stored for post test analysis or archived. Each ACP may have internal and/or external drives. Throughput disks are controlled via the SCSI port attached directly to the MDSP III inherent to each ACP. Optional throughput control software that operates under the Random application provides seamless operation during a control test so the operator need not contend with decisions about throughput disk operation during a closed-loop test. may be used as an opportunity to reprocess the time data with different transfer function pairings or averaging choices from the control scheme. This significantly enhances the analysis of post-test results.